No one will dispute the fact that Balboa Park is San Diego's unmistakable jewel—1,200 acres of greenbelt, culture, recreation, and attraction. It is San Diego's community gathering place, enjoyed by all citizens, of all walks of life and economic backgrounds. Sure we all know about the great museums and the Old Globe Theatre, but Balboa Park is much more than that. Everyone has their favorite Balboa Park spot, but here are a few known, and less known, places to discover. The main thoroughfare of Balboa Park, El Prado is the "downtown" of the park, where the public gathers and strolls to enjoy the magnificence of Balboa Park's beauty and architecture. Accented by the Spanish Moor-influenced buildings, remnants of the 1915 and 1935 World's Fairs, El Prado is the picture postcard spot of San Diego where you'll find most of the park's cultural venues: the Old Globe Theater, San Diego Museum of Art, Museum of Man, Natural History Museum, Museum of Photographic Arts, Mingei Art Museum. When you stroll down El Prado, seeing how everyone is enjoying the park, you realize how much Balboa Park means to both residents and visitors alike. El Prado is a must for anyone needing to feel invigorated about living in San Diego. It's a pretty obvious selection—when you're in San Diego, you visit the San Diego Zoo. But the Zoo is one of the world's greatest, with one of the most extensive and unique collections of animals and plants found anywhere. The exhibits and animal enclosures are innovative, especially Elephant Odyssey, Lost Forest, and Polar Rim. And, of course, there are Giant Pandas. That alone gives you a reason to check out the San Diego Zoo. If you've been to the San Diego Zoo, then you have likely noticed the nifty carousel and miniature railroad outside of the Zoo entrance plaza. The 1910 Balboa Park Carousel is a menagerie of animals and all but two pairs are original with hand-carved European craftsmanship. Also original are the hand-painted murals surrounding the upper portion of the carousel and the military band music. This carousel is one of the few in the world still offering the brass ring game for everyone taking the 5-minute ride. The Balboa Park Miniature Railroad takes a 3-minute, 1/2-mile trip through four acres of Balboa Park. The train, operated by the San Diego Zoo Department of Transportation, is a model G16 - now a rare antique with as few as fifty currently remaining. 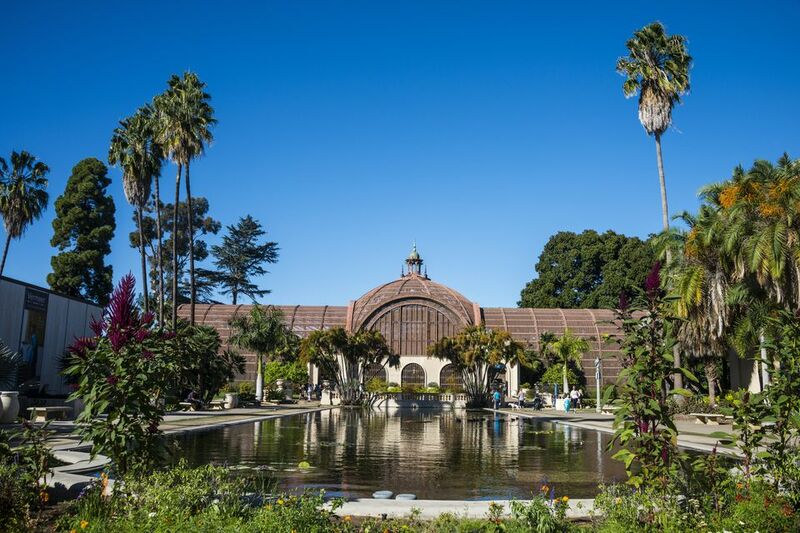 As you walk along the El Prado section of Balboa Park, you'll notice the Lily Pond first, and then the curious lattice structure of the Botanical Building. In fact, the view of the Botanical Building with the Lily Pond in the foreground is one of the most photographed scenes in Balboa Park. Built for the 1915-16 Exposition, along with the adjacent Lily Pond, the historic building is one of the largest lath structures in the world. Inside you'll find more than 2,100 permanent plants, featuring fascinating collections of cycads, ferns, orchids, other tropical plants, and palms. And don't forget to check out the Carnivorous Plant Bog. If you wander over off the beaten path of Balboa Park near the site of the old Naval Hospital, you can check out some fierce competitors in badminton, table tennis, and also volleyball. The Balboa Park Activity Center is a 38,000 square-foot multi-purpose gymnasium built to accommodate those gymnasium sports that the basketball-centric Municipal Gym across Park Blvd. can't accommodate. Located at 2145 Park Blvd. and set amid beautiful landscaping, public art, and spacious outdoor plazas, the Balboa Park Activity Center is a first-class sports facility. This list purposely doesn't include Balboa Park's museums because they are such known attractions. Except maybe this one: the San Diego Model Railroad Museum. Tucked away in the Casa Del Prado, the museum isn't always noticed by visitors heading to the Natural History Museum or the Fleet Science Center. But if you want to see something cool, you'll want to make a detour here. At 28,000 square feet, the museum is the world's largest operating model railroad museum. This unique museum contains four enormous scale and model layouts, built by separate clubs, which depict railroads of the Southwest in O, HO, and N scales. In addition, the San Diego Model Railroad Museum features a Toy Train Gallery with an interactive Lionel layout for children and state-of-the-art theater lighting. If you've ever been on the west 6th Avenue side of Balboa Park, near the Cabrillo Bridge, you might have noticed a congregation of people dressed in all white rolling things on a smooth, flat lawn. That, my friends, is the San Diego Lawn Bowling Club conducting matches. Organized in 1932 with five founding members, the San Diego Lawn Bowling Club is still going strong with active members. Club membership is open to anyone with an interest in the game. And the level of club involvement can range from playing in the occasional club social game to participating in club tournaments to competing in high-level regional and national competition. Sitting and watching the games is very calming, but at the same time, you realize there is a level of skill involved. And if your curiosity is such that you want to give lawn bowling a try, club members gladly give the public lessons. Balboa Park's House of Pacific Relations Internal Cottages represent and promote peaceful education and cultural exchanges to the public. Housed in historic 1935 Exposition cottages, 32 groups promote multicultural goodwill and understanding through educational and cultural programs. Every Sunday, throughout the year, if you wander through the cottage complex between the Organ Pavilion and the Air and Space Museum, you might learn a thing or two of a foreign country during an event or presentation. A lot of people don't realize or just forget that Balboa Park extends beyond Park Blvd. east across Florida Canyon. You won't find museums or theaters here, but you will find a whole lot of recreational opportunities at the Morley Field Sports Complex. Frisbee golf? Track cycling? Tennis? All found here. Located at Texas and Upas Streets in the northeast corner of the Park, this complex offers a vast array of sporting activities from tennis, swimming, and archery to disc golf, bocci ball, and velodrome cycling. Four athletic fields (one lighted), a two-mile jogging trail plus an 18-station fitness course are part of the complex as well. Tucked between the San Diego Zoo and the Natural History Museum is a wonderful place to just sit and enjoy the arts and crafts taking place. It's a unique courtyard of art shops called the Spanish Village Art Center. Thirty-seven working artist studios/galleries host over two hundred independently juried local painters, sculptors, metalsmiths, jewelry designers, clay artists, gourd artists, photographers, printmakers, fiber artists, basket weavers, mixed-media artists, glass artists, and more. The historic Spanish-tiled buildings, the colorful patio tiles and the working artist studios all make for a very creative setting.